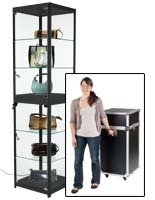 This illuminated display storage tower offers a stylish look and durable construction to match the needs of high traffic public environments such as retail stores, galleries, schools, or lobbies. 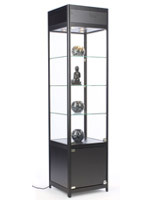 Each 78" tall fixture offers sturdy black finish MDF and aluminum framing for stability. 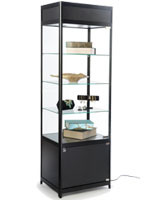 The tempered glass display storage tower features three interior shelves that are top-lit by three halogen lights set into the canopy. 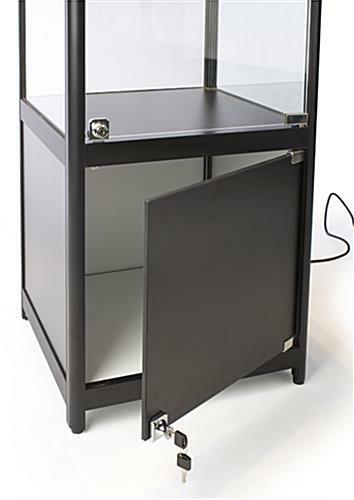 This 20" square freestanding fixture includes a hinged access door and base cabinet, both of which have plunger locks for security. 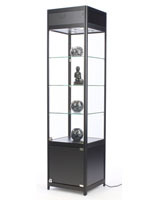 This black finish display storage tower is ideal for showcasing retail merchandise, school awards and trophies, as well as commercial products or samples. 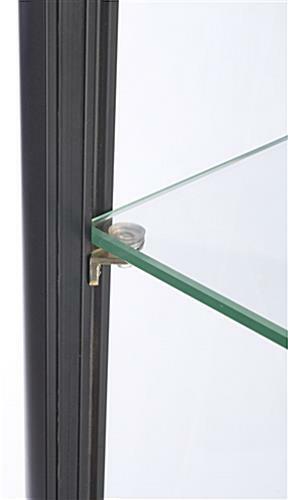 This top-lit locking cabinet's tempered glass sides and shelves are impact and shatter-resistant for safety in public environments. 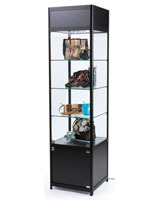 This freestanding storage tower offers high visibility in any direction, making it a great choice for showcasing retail merchandise or showroom samples. 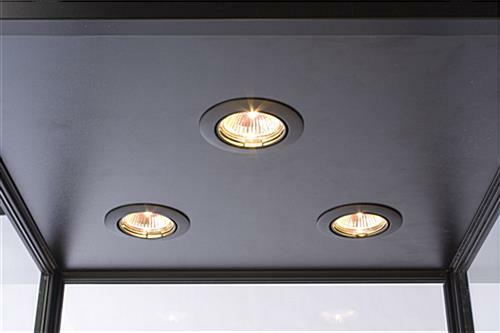 The three halogen top lights provide brilliant illumination for contents. 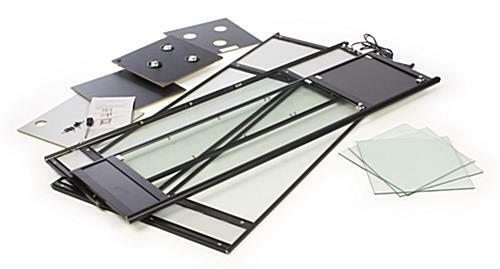 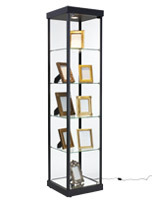 This tempered glass tower's black framing will complement any decor. 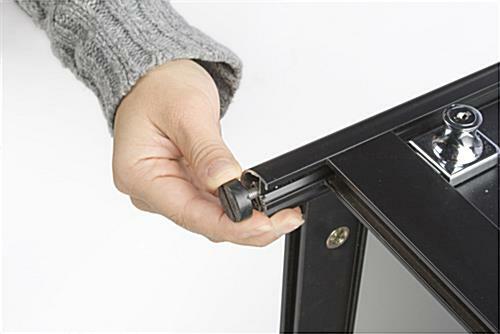 Each stylish merchandise cabinet ships knocked down and comes with simple, easy to follow directions for assembly. 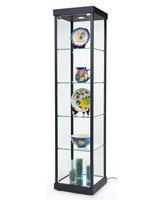 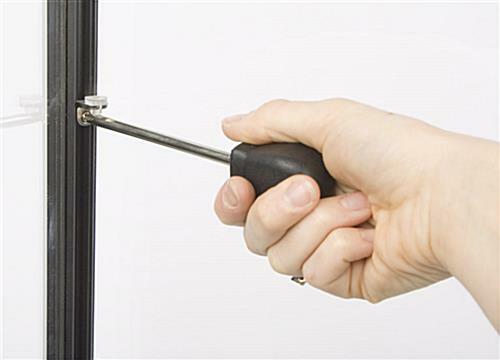 20.0" x 72.0" x 17.5"
19.0" x 16.8" x 19.0"